It is with great sadness that we give you the news that Dr. John Hilton, a Life Member and former Captain of Tees Rowing Club died on Sunday January 17th at the age of 86 (pictured 2nd from left with the crew of 1958). The Minihead this month ran smoothly, despite initial concerns about ice beginning to form due to the cold, still conditions. Thanks go to the Masters Men's & Women's squads for marshalling, timing and feeding the 18 boats taking part this month. Due to the effects of the recent weather, we had a visiting quad's-worth of rowers from Bradford for this month's event. We hope they all had a good time, and they are very welcome to come back for more another time. 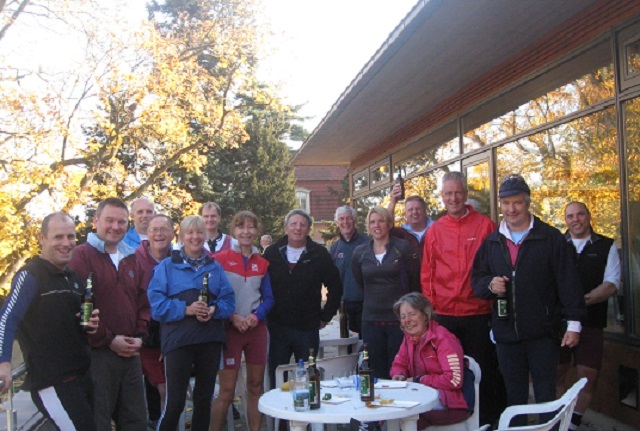 Next month's event will be on Sunday 14th February, and will be co-organised by the Mixed Masters Novice squad and the ParaRowing squad. Many thanks to the WRecK rowers for a seamlessly run event this month, complete with mulled wine and mini mince pies along with the sandwiches and hot drinks after the racing! 17 boats raced this month, although there were four boats hoping to compete who fell victim to mechanical issues or the high turnout combined with a clogged pontoon. The inaugural event of 2016 will be on 17th January and will be run by the Masters Men & Women's groups. GET YOUR STOCKING FILLERS AND SUPPORT TEES JUNIORS AT THE SAME TIME!